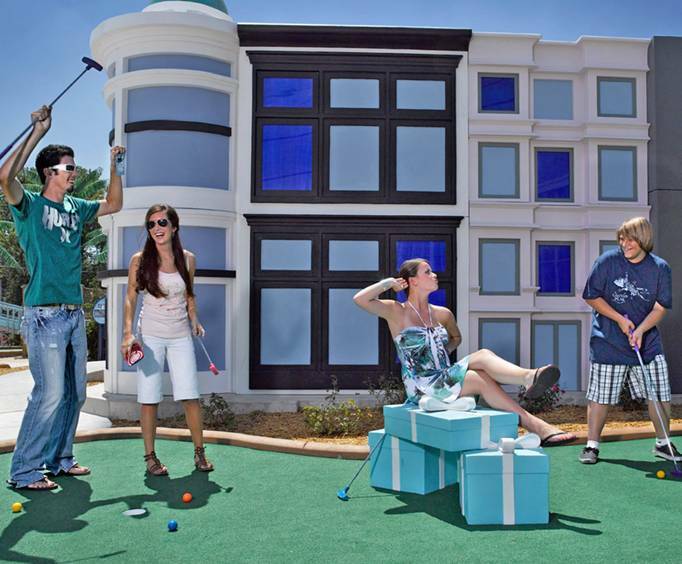 Make your claim to fame at Shoot For The Stars Mini-Golf. Each of the course's 18 holes is a step toward becoming a Hollywood star. 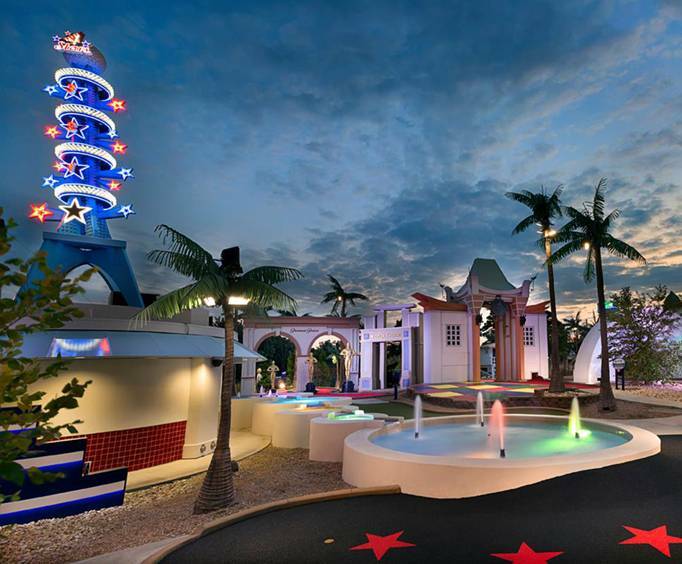 Shoot For The Stars is more than just putt-putt golf, it's a themed interactive experience. As you make your way through a mini-golf course filled with palm trees, parties, and paparazzi, you'll become a star yourself. At the first hole, you'll meet your new agent, Marty McBooster, who will stay with you along the way dispensing hilarious advice on how to make it in Hollywood. You'll see famous Hollywood landmarks like the Hollywood Bowl, Grauman's Chinese Theatre, the Capitol Records building, and the shops on Rodeo Drive. You're sure to get lots of star-quality photo ops as you make your way toward the final golfing challenge at the Walk of Fame! Your admission ticket grants you the opportunity to not only experience all of the fun at the Shoot for the Stars Mini-Golf Attraction, but also the Hollywood Wax Museum, Castle of Chaos, and Hannah's Maze of Mirrors. Castle of Chaos: The Castle of Chaos adventure is sure to be a blast. This 5D gaming experience allows guests to be transported on a thrilling adventure. Compete against family and friends to see who can be the top score winner in this shoot-em-up game! Mini golf was fun. Any age would enjoy. Wish we had discovered this the first day. All of us loved this and would have enjoyed over and over.